Red phone box, Marygate. The view down Marygate from Bootham is, as I’ve mentioned before (often), aesthetically pleasing. There are many elements making the scene seem a special one, but perhaps most immediately pleasing is the red phone box. This ‘K6′ type of kiosk was designed in the 1930s. These design classics are generally admired, but look their very best against a pale stone wall, with some green nearby. As here. This type were apparently manufactured until 1968. 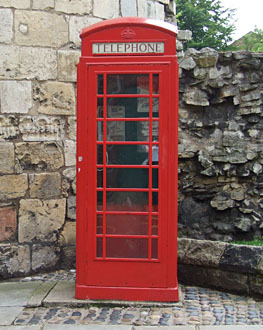 Many villages seem to have retained their red phone kiosk. I’m not sure how many are left in York. I pass three fairly regularly on my way into town. All three, including this one, are looking increasingly shabby, and two are frequently vandalised. Two have Listed status: one on Duncombe Place, and this one on Marygate. They’re very rarely used now, phone boxes, for obvious reasons. We carry our phones around with us. The kiosks remain but, Listed or not, it’s hard to see them being maintained indefinitely. They must cost more in maintenance than they make. The photo above was taken in 2007. The phone box showed signs of graffiti having been cleaned from its panes, and had the remnants of stickers clinging to bits of its paintwork, but otherwise looked fairly smart. Not now, in November 2012. A couple of panes are broken, others are still discoloured and opaque from being cleaned so often. Graffiti continually ‘redecorates’ this kiosk. 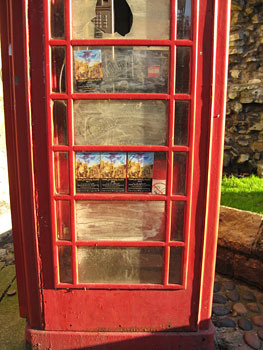 Added decoration this year in the form of fliers for the York Mystery Plays 2012 production. This ended more than two months ago. As this Listed monument of a phone box isn’t far from the Museum Gardens performance site, I thought they might have been removed by now. I attempted to remove one myself, thinking it would just lift away easily, but it didn’t. They appeared to be quite firmly attached. Maybe whoever stuck those cards to the panes could return and remove them. More respect please for these design classics, and particularly for this Listed one, which so beautifully enhances its corner of York. 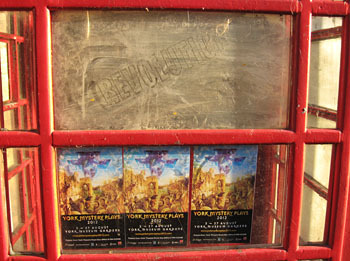 By Lisa @YorkStories • 10 November 2012 Streetscape To link to this page's proper location please use the > permalink. Very poignant photo for me as someone who used this box most term-time Sundays for several years in the 1970s to call my parents (reversed charge) whilst a boarder over the road at Bootham School. One could call from a payphone in the school but it was often in use and, like much of the communal life, not very private. Sorry to see it sliding into disrepair due to its obsolescence and new technolgy. Despite arriving 600 years after the medieval tower they do seem to belong together incongruous as such a juxtaposition of ancient and modern really ought to be. Is our modern street furniture a patch on the K6? Perhaps the next casualty of progress in communications might be the good old red postbox, not to mention the postie him/herself.